Marvin Zou ('19) elevates past defenders to lay the ball in. What started as a tame, low-scoring game quickly became a nail-biter as the Vikings narrowly beat Cupertino, 39-38, after Conner Lusk (‘20) scored the go-ahead jump shot to close out the game. The first quarter (and largely the first half) were unremarkable in terms of scoring; despite flashes of high-paced play coming from the Vikings, who chose a unique defensive scheme in which they played full-court press on nearly every Pioneer inbound, both teams found it difficult to score. With almost half of the first quarter over, the score remained a paltry 0-1 with Cupertino leading, despite some sloppy play leading to fast-break opportunities that were ultimately not converted. Indeed, that sole point came from a free throw, characterizing the offensive challenges faced. While Paly jumped out to a respectable 5-1 lead, with Marvin Zou (‘19) contributing with a difficult, contested layup and free throw, and Wes Walters (‘19) adding a lay-in after an equally difficult offensive rebound, Cupertino quickly tied the game up 5-5 with 3 minutes to go. The game was a back-and-forth affair for much of the quarter, with both Zou and Cupertino’s Jack Townsend (‘20) chipping in. Cupertino lead 9-7 at the end of the first quarter. After the break, the game featured much of the same; it was clear both teams were heavily relying on their defenses to make up for the lack of offense. Zou would cut the lead to 2, only for Richard Yang (‘19) of the Pioneers to return the favor and widen the gap to 4. Neither team was able to sustain enough stops in a row to gain significant momentum. 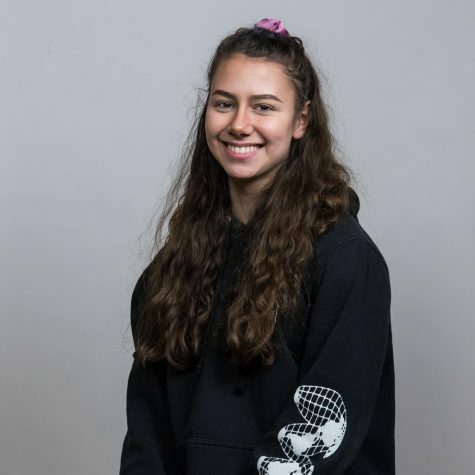 Paly’s aggressive defense seemed to be key in stopping the back-and-forth battle, forcing Cupertino players into a good amount of cross-court passes going nowhere. Cupertino, for their part, were relying heavily on a strong point presence headed by Yang, considering the outside shots weren’t falling – in fact, neither team made a 3 until Zou broke the spell with 1:31 left to go in the half. Matthew Marzano (‘20) and Jamir Shepard (‘20) were also essential in rallying the team and scoring timely points, and the Vikings ended the half up 21-13. But despite the comfortable lead they had built in the 2nd quarter, troubles began for the Vikings in the 3rd. Despite nice offensive showings from Lusk and Zou, the onslaught from Cupertino began. 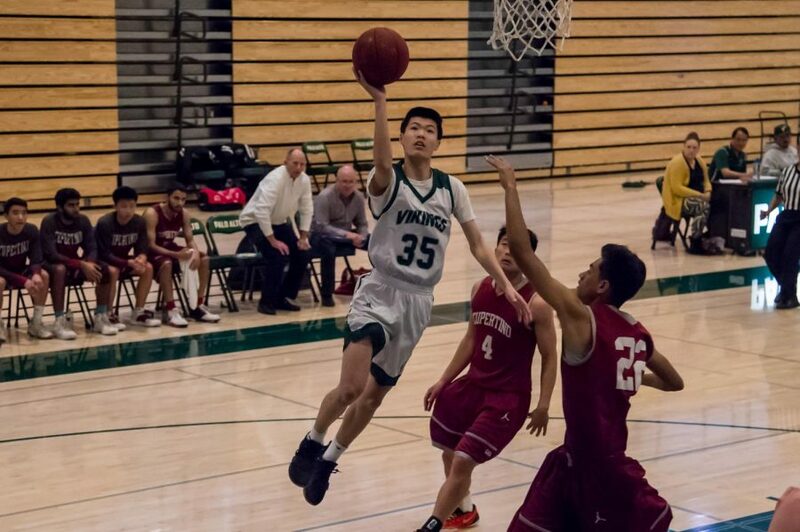 John Duan (‘20) was the driving force for Cupertino, scoring from all areas of the court and making it look easy as he did it – whether it was jump shots from the key along with Yang, layups off of fast breaks, or deep threes, the lead quickly dwindled down to only 4, with Paly failing to score for an extended period of time. The Viking efforts weren’t helped by their fouling, which often led to the ball returning to Cupertino’s hands even if Paly had managed to get a rare stop. Paly wisely called a timeout before Cupertino had a chance to make it a single possession game, and attempted to weather the storm. Although from the perspective of a fan, the game was getting out of hand, Shepard says he never had doubts the team would emerge as victors. The positive outlook could only help so much – Yang cut the lead to just 2 with a fade-away jump shot out of the timeout. Finally, with 1:48 to go in the quarter, Lusk managed a 3 to end the drought, but just as it seemed that Paly was turning the tides, they turned the ball over again. Ultimately, despite sloppy play from both teams to end the quarter – both clearly exhausted – the Pioneers were within 3 of the Vikings by the end of the 3rd, with a score of 31-28. Opening up the 4th quarter strong, Shepard was able to get to the line after creative footwork, and Zou went coast to coast off of a missed three to lay it in – blink, and you’d miss him streaking down the court with a speed that seemed to far surpass that of either team. Within the first few possessions, the Vikings had extended their lead back to 8, nearly their highest lead in the game, which never surpassed 13. But a memorable up-and-under layup from Duan, Cupertino’s star player of the night, made it clear that the Pioneers would not be laying down and taking the loss – and if it wasn’t clear enough, a deep three from Townsend that cut the lead to 5 made it obvious the game was far from over. Duan continued his flashy performance with an incredibly challenging layup in the paint off of a steal through traffic, earning an and-one opportunity and cutting the game to 2 points with 3:25 left in the game. It was reminiscent of Kyrie Irving dazzling defenders, and the Viking players were equally tested with the task of stopping him. Although a controversial call on Cupertino, with Pioneer players arguing with the refs, should have returned the ball to Paly, a critical offensive foul on Paly gave Cupertino the chance to tie. With 2 minutes left in the game, Yang sunk a deep three and put Cupertino up 1. A series of errors seemed to spell a loss for the Vikings – another offensive foul sent the ball back to Cupertino, and despite their failure to score, Paly then missed a critical three. Cupertino was set to inbound the ball with 25 seconds left, up 1. Paly fouled – seemingly unintentionally, as Marzano threw his hands up in protest – to give Duan a chance to extend the lead to 3 with a 1+1 free throw situation. But a twist of fate was in store for the Vikings. Duan missed the first free throw, and Jackson Chryst (‘20) was able to secure the rebound, with Paly quickly calling timeout. With 16.7 seconds left in the game and down 1, Paly needed a miracle. And it was delivered: Despite a haphazard play unfolding and a near-turnover, the ball made its way to Lusk’s hands, where he casually delivered the game-winning floater. Paly earned a hard-fought victory at the buzzer: 40-39, Vikings. Lusk said the victory came as a surprise to him, and not just because of the shaky second-half performance. The team could be seen cheering Lusk on animatedly from the sidelines, no doubt happy not only that he could get the experience of a game-winning shot, but also to take home the win. The Vikings won’t have long to celebrate their comeback, however – they play their next game on February 1st away against rival Los Gatos at 7:45 p.m.